Saint Tulsidas says, “no evil or dark force ever dares to come near those who chant the name of Mahaveer (the valiant one) or Hanuman”. Hanuman is an incarnation of Lord Shiva and the greatest devotee of Lord Rama. It is believed that propitiating him would nullify the painful effects caused due to Saturn and Mars. He is believed to have control over the nine planets with the power of his tail. 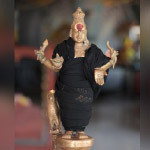 He is worshipped to get relief from problems, diseases, success in endeavors, subduing enemies, knowledge, mental strength, wisdom and help neutralizing evil spirits and effects of black magic. Saturdays and Tuesdays are ideal days to worship him.